For the second year in a row there isn't much doing in the drivers' market for the front running teams. The 'big four' teams - Red Bull, McLaren, Ferrari and Mercedes - won't be changing their race line ups, barring something unusual happening, making 2012 the third season in a row that the familiar faces are occupying those seats. Instead, we've had to look to the next team up in the constructors' table for our dose of driver market intrigue. It's just as well they've been providing plenty of this all by themselves, enough for the big four teams put together. Renault have had a four into two conundrum for their 2012 line up (by which time they'll be called Lotus - do keep up at the back) for some time. The drivers in question, all currently on the Renault payroll one way or another, are Robert Kubica, Vitaly Petrov, Bruno Senna and Romain Grosjean. In recent days though something resembling clarity has descended upon the situation. First off: Robert Kubica, who appears to have been ruled out rather than ruled in. Of course, in terms of pedigree Kubica is on a different level to the other three potential pilots, and all things being equal he'd be the first pick for a seat. But as is well known, all things aren't equal. For one thing, he is recovering from a rally accident, which occurred in February before the season started. He hasn't driven anything in anger since, and subsequent reports of his condition have been patchy and often conflicting. But what isn't in doubt is that the recovery is taking slightly longer than what was hoped for at the outset (his manager said initially the aim was to have Kubica back driving by this year's Brazilian Grand Prix, which clearly isn't going to happen) and his ability to drive as before at the end of it is unknown. Were he in contention to start 2012 as a race driver his team would have wanted him at least driving a 2009 car (the most recent available outside of official allocated testing) in anger by now, given pre-season testing already beckons not far ahead. This is especially that, even if Kubica does prove himself able physically to return to driving, it remains to be seen the extent that he can recapture his formidable form of before. It therefore seems that Friday testing from the start of the 2012 season is the soonest anyone can hope to see him back. For another thing, and a factor that many have forgotten, Kubica's Renault contract expires at the end of this year. So from that point on he has no obligations to the Renault team (nor for that matter, them to he, though team principal Eric Boullier has said that the team have a 'moral obligation' to offer a car for testing to Kubica if/when he does return). 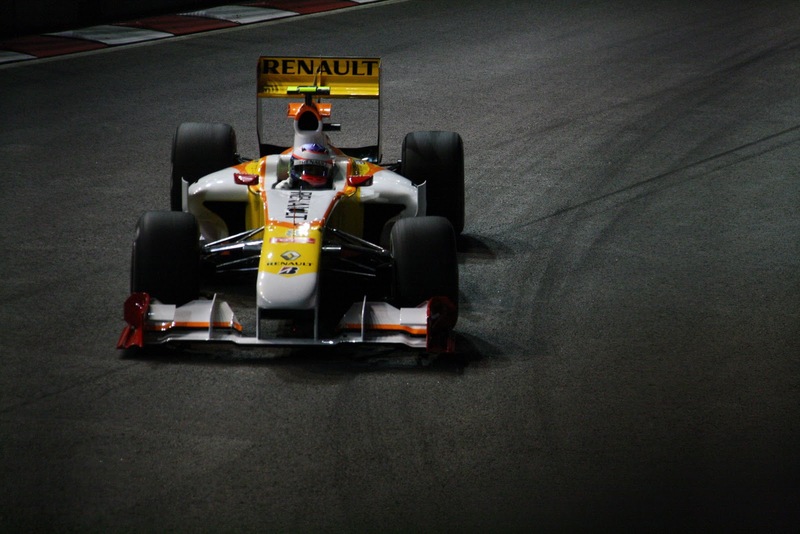 But in recent days it's looked rather like Kubica will not be hanging around at Renault for 2012. This is perhaps understandable from his perspective - given the poor time of it the team have had this year. 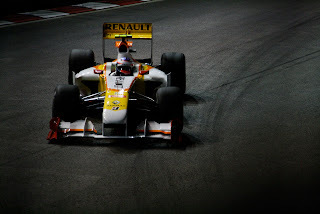 From the point of the first 2012 test in Valencia, when Kubica topped the times and Renault caused head scratching up and down the pitlane with their radical front facing exhausts, the trajectory downwards from that high point has been uninterrupted virtually. In the first two races they were among the Ferraris and McLarens and scored podium finishes in both, they then fell back to become best of the rest in the second half of the top ten, before gradually sinking further and further into the midfield mire as the season has progressed. The exhaust system proved unsuitable for the handling resultant of the Pirelli tyres, particularly in slow corners, and worse precluded development of the car elsewhere, making the team sitting ducks. While all this was going on a driver was sacked (Kubica's replacement, Nick Heidfeld), and many technical staff left as Boullier undertakes a radical path of reform, all giving rise to suggestions of a rather unhappy camp. What's more, even though Kubica is sitting out the entire 2011 season, teams who could provide him with race winning machinery continue to show interest in him. Boullier is absolutely correct to say that, as far as race seats for 2012 are concerned, these avenues are blocked off, but 2013 is a different matter. Both Ferrari and Red Bull are likely to have seats unfilled: Ferrari have been transparent about Felipe Massa's need to up his game if he's to be retained for that year onwards, and come 2013, when Mark Webber will reach his 37th birthday during that season, Red Bull may be of the mind to replace him with a younger model. Ferrari have already shown their interest in getting Kubica aboard - they have an annual option agreed to recruit him (and had it not been for his accident it's impossible to think that the Scuderia would not have taken this up this year). And in many ways Ferrari is the perfect destination for Kubica. Ferrari of course are the one team in F1 with a private test track, and in this scenario Bobby K can pound around Fiorano in a 2010 Ferrari every waking hour of next year. This would be perfect not only for re-building confidence and ascertaining the extent that he can regain his pace, it will also be ideal for him re-establishing his full fitness to drive an F1 car, a process that has been estimated to take around six months. Another benefit of this option, as pointed out by Jonathan Noble in Autosport, is that there will be no pressure for Kubica to return to racing before he's ready. On the face of it, it appears that a plus of staying at Renault is that both Friday testing and racing in 2012 look much more readily available than at Ferrari or Red Bull where, presumably, even if he does do well he won't be racing the car before 2013 (or at the very least, only undertake some late 2012 'sighters' for the team or farmed out somewhere else). But, in a business where he may be written off very rapidly if he returns ahead of time and doesn't perform well, holding off until 2013 could be an attractive factor. Red Bull have yet to show their hand over Kubica, but it seems likely they'll be interested and may seek to offer him something similar to Ferrari. Though they don't have the benefit of their own test track, as things stand they do have the benefit of offering the quicker car. So, with all that it looks a long shot that Kubica will in the Renault/Lotus stable next year. That Boullier has admitted that his relationship with Kubica has gone rather mute in recent times, as well as said that his priority for 2012 'is not to have a big name in the car but to have a fast car', further indicate that Kubica's 2012 fate is signed and sealed, and won't be with his current employers. That leaves two from three for the 2012 Renault drives - Petrov, Grosjean and Senna. Vitaly Petrov is in many ways the incumbent of the three. He's reaching the end of his second season racing with the team, since debuting for them (and in the sport) at the start of 2010. He came to F1 with a reasonable pedigree from GP2, and in that time he's demonstrated that he definitely has a competent, if not necessarily a top-drawer, F1 talent. There also has been a clear improvement in his performances between last season and this, despite the frustrating time the team have had in terms of competitiveness. Some 2011 drives have been good: the podium run on a two-stop strategy at Melbourne is the topline, but the performances at Monaco, Spa and Suzuka were also strong, as was the qualifying run at Monza. But he's also never been able, yet, to remove crashing and off track excursions from his repertoire to a sufficient level. The famous flight that put him out in Malaysia, while unfortunate in some ways, betrayed his inexperience (and came just at a time people were talking about him finding a new maturity), and his ride over the back of Michael Schumacher's Mercedes at Korea, watching Fernando Alonso too much, was also memorable. There were also off track excursions at Abu Dhabi and Spa, and mistakes in India probably cost him points. Still, he has a contract for 2012, and while there are areas for Petrov to work on there doesn't seem to be a damning case to remove him. Further, Petrov helps to balance the books. Petrov is Russian and is well-connected to sources of 'new money' from that country. The presence of Lada and vodka logos on the Renault are evidence of this. Plus, apparently, for a long as Genii have an interest in the team Petrov's seat is protected, as they have plans to expand their business into Russia (though James Allen commented recently that there are rumours that the team aren't quite as happy with the flow of Russian money as they might be). That there is to be a Russian Grand Prix from 2014 also helps him. Petrov did do his best to talk himself out of a Renault/Lotus drive for next year, when a frustrated diatribe against the team given on Russian TV after the Abu Dhabi race was reported yesterday. It all proved to be a storm in a teacup however, with Boullier, perhaps unusually for him, stroking the ruffled feathers down and declaring the matter closed as far as he's concerned after Petrov apologised. This all further suggests Petrov will be a Renault driver in 2012. That leaves Romain Grosjean and Bruno Senna facing off for what presumably will be one remaining Renault/Lotus race seat. And it looks like Grosjean will be the man to get it. This is despite the fact that it was Senna, not Grosjean, who got the gig after Heidfeld's sacking after the Hungarian race this year (though Grosjean may have been reluctant to step in after having his fingers burnt taking a similar mid-season opportunity in 2009). Boullier's public pronouncements on Grosjean's potential give every indication that he intends to have him in a race seat next year, recently stating that, if Kubica is not available, Grosjean is 'definitely one at the top of the list', and going on to say: 'When he runs on Fridays (in practice) he shows that he can deliver and gives good feedback. Clearly the guy has talent everybody is convinced about that. It is my job to make him ready to step in'. Those who've followed F1 for a few years may recall Grosjean as the unconvincing presence at Renault in late races of 2009, but he certainly looks a more substantial offering now than then, and it's admirable that he's come back at all in a business that makes its mind up on drivers very quickly. Further, his drives that year, given the circumstances, perhaps weren't as bad as some have suggested. Being team mate to Fernando Alonso is usually a graveyard shift (ask Felipe Massa), the Renault R29 was a difficult, uncompetitive machine, Grosjean had no testing and the team were in turmoil off the track. With all this, the average gap between Grosjean and Alonso in qualifying was under sixth tenths of a second. Given everything, that wasn't a bad effort. That he's been asked to run in Friday practice in the final two rounds of this year shows that the team is keen to run him, and he did himself no harm in Abu Dhabi by stepping in and setting a time half a second quicker than Petrov managed in the same session. This all leaves Bruno Senna as the odd man out, seemingly (despite the insistence of his mother that negotiations with the team for 2012 are ongoing). This is a pity because, as with Grosjean in 2009, Senna's not disgraced himself all things considered since stepping in (i.e. no testing, thrown into a struggling car etc). He even started well: qualifying seventh in a wet-dry qualifying session in his first outing in Spa, then coming through the field impressively to finish ninth in Monza (though he did qualify four tenths shy of Petrov) and then being clearly the better of the two Renaults in their horrendous weekend at Singapore. He even attracted a few sponsors to the team - a fact that the additional logos on the car after his arrival made obvious. Since Singapore he's struggled however, rarely getting on terms with Petrov or extracting himself from the lower part of the midfield, at precisely the point that he needed to be reaching for the sky. So, after months of speculation, it now looks as though the Lotus (née Renault) drivers for 2012 will be Vitaly Petrov and Romain Grosjean. We'll need to look elsewhere for our intrigue. It'd be a shame to have Senna out. I think he's done a decent job with a so poor car. Surely it would be interesting to see what Bruno can do with a better car and why not in a different team. Thanks for your thoughts Mario. It would indeed be a pity for Senna if he misses out. I always say it's very difficult for a driver to step into an F1 drive mid-season without any testing, and given all that Senna's done a very respectable job this year. To be honest though, I get the impression that Grosjean was always the guy that Boullier planned to fill that seat for 2012, he clearly rates him very highly. Therefore, Senna probably had to do something really special in the car to usurp Grosjean in the running for the empty seat. It's not obvious where Senna can go if he doesn't get the Renault drive, there aren't many empty seats left. Having said that, I didn't see De La Rosa to HRT coming at all, so who knows who'll be on the grid in Melbourne 2012! Plus he brings sponsor money, as I said.